Cucumber Salsa. Cool, refreshing, delicious. Here is another fabulous recipe that I have learned from my mother in law. She can whip up anything from an idea, and it tastes wonderful. There is a salad that she serves, often in place of a lettuce salad, or sometimes in addition to a lettuce salad. It’s simply made with cucumber, tomato and onion, and seasoned with lemon juice, olive oil and salt. It is cool, refreshing and delicious. One day, she had the idea to add avocado to it and serve it alongside corn chips, as a dip. I was soooo good. At dinner, I piled a huge spoonful of it on my plate and that was mainly my dinner. (Don’t worry, I made room for the rest of her yummy food on my plate as well). In the future, I will try to post the cucumber, tomato and onion salad. Today, I would like to share the ‘salsa’ version. 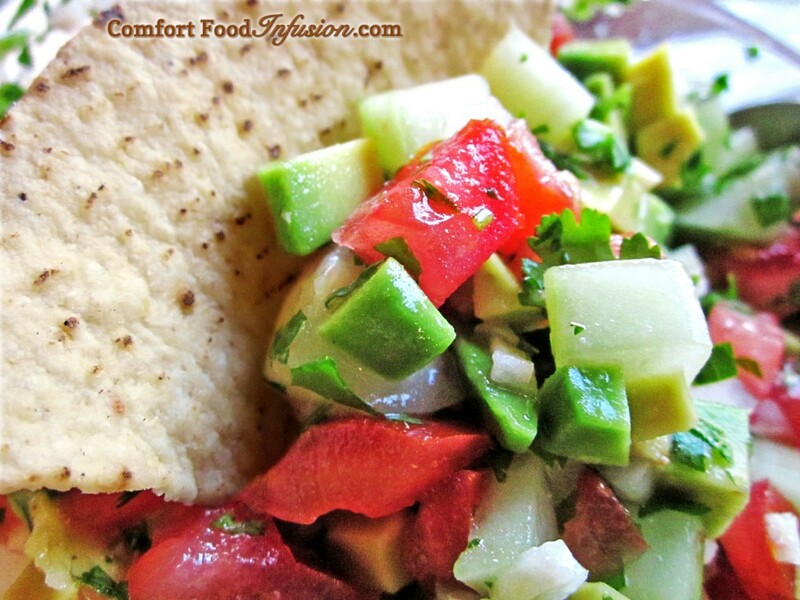 A deliciously cool salsa with the addition of cucumber. Spice it up with jalapenos, if desired. 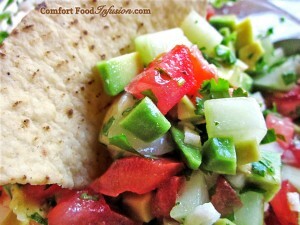 In a medium sized serving bowl, combine diced cucumber, tomato, onion, avocado; chopped cilantro and garlic. (Add chopped jalapeno, if desired). Add to the veggies: lemon (or lime) juice, olive oil, salt and pepper. Stir to combine.